Kristen Ghodsee, "Capitalism between the sheets: sexual economics theory and the commodification of everyday intimacy"
In this talk, Kristen Ghodsee, Professor of Russian and East European Studies at the University of Pennsylvania, will consider historical evidence from state socialist countries in the former Eastern Bloc to explore how and why intimacy might change in an economy where affective resources are not priced by the caprices of supply and demand. The talk will discuss the rising popularity of sexual economics theory in the United States, which imagines heterosexual courtship as a market transaction between sellers (women) and buyers (men) who are trying to maximize their individual utility. 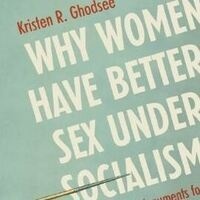 Rather ironically and unknowingly, contemporary proponents of sexual economics theory have resurrected and promoted 19th and 20th century socialist critiques of capitalist sexual relations. This talk will consider historical evidence from state socialist countries in the former Eastern Bloc to explore how and why intimacy might change in an economy where affective resources are not priced by the caprices of supply and demand. In his seminal 2009 book, Capitalist Realism: Is There No Alternative?, the British cultural theorist Mark Fisher posited that “the pandemic of mental anguish that afflicts our time cannot be properly understood, or healed, if viewed as a private problem suffered by damaged individuals.” Fisher argues that the precipitous decline in mental health in late-stage capitalist societies is both the particular product of a pervasive sense of hopelessness and a collective inability to imagine alternatives to the continued hegemony of neoliberalism, as well as the result of a commodification and concomitant pathologization of human emotions. Building on Fisher’s work, this talk considers how the logics of capitalism pervade and restructure intimate relations. Sponsored by the Heilbroner Center for Capitalism Studies, the Anthropology Department, and Gender Studies at the New School for Social Research.